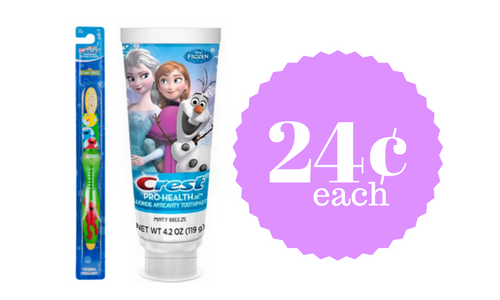 Home > Printable Coupons > Crest Toothpaste & Toothbrushes, 24¢ ea. Crest Toothpaste & Toothbrushes, 24¢ ea. Stock up on Crest toothpaste and toothbrushes for kid’s for only 24¢ each when you pair in a printable coupons with a Balance Rewards deal at Walgreens. This deal ends 12/24, so print your coupons and head to the store! These would make for simple and easy stocking stuffers if you need a few items.